Candlelight Confessions – Dancing in the rain! I am a self diagnosed night owl and have a problem going to bed, in the same token when I stay up till all hours of the night (technically morning) I am not exactly excited in the morning when my alarm goes off. I do however have a great appreciation for the early morning hours the rare time I experience them. I like that the floor is cool on my feet and the weather hasn’t quite been decided. I like the smell of fresh brewed coffee and the warmth of a fuzzy robe. I like the sound of the traffic as early morning commuters start their day. However I also like the quiet of the late evening hours with pale shimmering moonlight struggling to peek through the slats in the blinds. I am writing by candlelight with the drone of classic rock radio in the background contemplating how I can manage to enjoy my late evenings and still manage to see early mornings. It seems a challenge, especially for someone like me who also enjoys sleep. It was 3 am this morning when I crawled into bed. I love that feeling of lying on my belly, stretching out my limbs and sinking into the warm comfort of my bed, quickly contemplating my day and taking a moment to smile and be thankful for the good parts. This week I was extra thankful for a long weekend, it really seemed to last for an eternity. On Friday Morgan turned 14. Where does the time go? Hubby is away working so we decided to take off after the Remembrance day ceremony at school and have a girls fun day! Morgan had the opportunity to design her custom Antiks . Antik Skate Boots are born of passion, design and quality, brought together by Mo Sanders aka “Quadzilla”, a lifetime skater who put his heart and soul into the process and design of the way roller skate boots were made. Morgan started Roller Derby when she was ten (almost 11) and these are her dream skates. They are pricey but I am told they are worth every penny. After a day a Roller Skate shopping, clothes shopping and dinner we picked up a friend of hers and one of mine and we went to the local Roller Disco. My friend commented on how it appears that Morgan seems at home on skates and this is true. On skates she feels free and content. 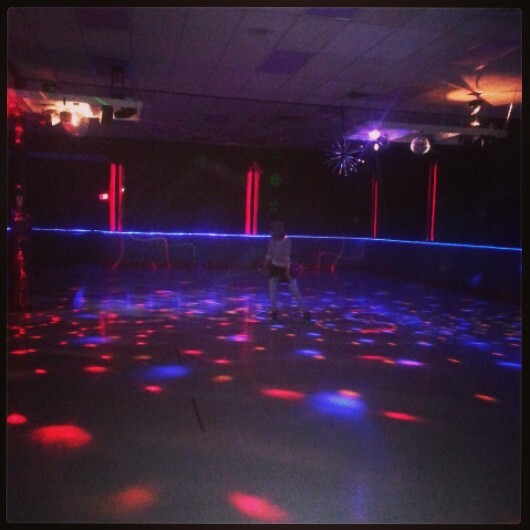 Haley as well loves the freedom of skating till your hearts content with disco lights and loud music. I admit it is hard not to get caught up in the atmosphere. I am not fearless like my girls but I strapped on a pair of vintage rentals and happily rolled around to classics such as I love Rock and Roll and Don’t Stop Believin. I really did have fun. Morgan introduced me to the world of live streaming movies so I watched more movies in one weekend then I usually watch in a year. At one point Morgan and I were curled up in front of a roaring fire watching a romantic comedy while Haley gallivanted around the rec-room in her make-shift dance attire watching Dance Moms on YouTube and making her own dance routines. Then Haley would come hang with me while Morgan watched the WFTDA championships (Women’s Flat Track Roller Derby Assoc.). I got to hug my girls, stay up late, sleep in, make good meals, read stories of war recollections out loud so that they can truly understand the meaning behind Remembrance Day and share some big hugs and laughter too. I got to talk to them candidly about current events, issues that they will one day face and give them my special blend of Mom wisdom that I am sure they cannot get enough of. Alas all good things must come to an end and without a fight to stay up late they snuggled into their beds and fell fast asleep. I immediately missed my husband. I realized that though we texted in the morning and when he got off work we hadn’t spoken on the phone. By the time I realized how much I missed the sound of his voice it was way too late to call. He will be rising early as he always does, facing a frosty morning and a full workload. So as my candle flickers, illuminating the darkness I am a little lonesome but very thankful for my husbands work ethic and dedication and how it affords me the time to raise our girls and not allow society to do all their rearing. I am thankful for so many things, not the least of which being the remarkable sacrifices those who have served our country past and present have made so that we can enjoy our beautiful country and live free. Haley and I skating at the Roller Disco!! Previous postIf You think you can you’re right, If you think you can’t you’re right too!! I am so proud that your girls are being taught the significance of the Nov. 11 holiday so it isn’t just a day off school, like it was for us…. we didn’t truly appreciate it until we were adults. Isn’t that sad? Love your posts, btw! I share your love of late nights, and love of early morning. Often (almost always) sacrificing appreciation (although, lack of appreciation doesn’t keep me in bed any longer most mornings) of the morning, to stay up wayyy too late. I miss rollerskating. I used to do it all the time in elementary and middle school. Do you have somewhere handy to Roller Skate, get back into it!! It’s fun! !